The 15 November of 1976, offshore the islands Hawaii, an unknown shark was trapped in a net of depth: it was the Megachasma pelagios.. The scientific name points out the principal characteristics of this mysterious cartilagineous fish and that is the enormous mouth (Megachasma) and the presence in pelagic waters (pelagios). The head of this shark is very ample, long almost halves the whole body, and also the eyes are very great. The mouth, as already mentioned, really enormous and the teeth numerous but of small dimensions. 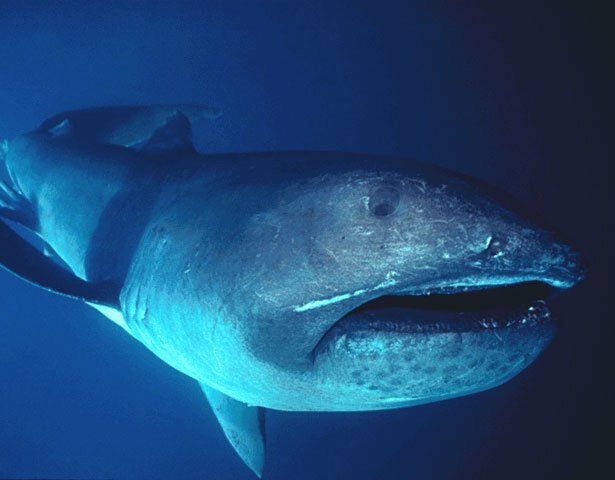 The coloration of the "megamouth" is very dark, almost blackish in the whole body, while is white-silvered on the lip and in the oral cable. Probably this is due to the presence of photophores, bright organs responsible of this silvery "covering" very reflecting in the lip and in the mouth, which would attract plankton (prawns and small shellfishes) of which the shark nourishes him. The Megachasma pelagios, as the whole shark and the basking shark, feeds him of plankton, that filters from the water swimming and remaining with the enormous opened wide mouth. During the day he remains in very deep waters, from 300 to 1000 m, while in the nighttime hours it goes up among the 100-500 m. The greatest known sample had a length of around 5 meters and a weight of around 1200 kg. The megamouth is probably viviparous without placenta, but also in this aspect of its biology there is no safety, being this a kind "new" to the science (first sample known in 1976) and having been analyzed only few samples.